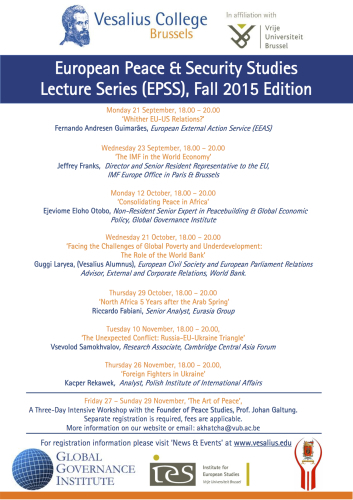 The Global Governance Institute, in cooperation with Vesalius College Brussels, the Institute for European Studies and the Belgian Royal Military Academy is proud to announce its upcoming schedule for its European Peace an Security Lecture Series for Fall 2015. The format for the EPSS lectures is a 40 minute lecture with a 30 minute Q&A session, followed by a light, informal reception. Unless announced otherwise, all events will take place at Pleinlaan 5, 1050 Brussels. Guggi Laryea, European Civil Society and European Parliament Relations Advisor, External and Corporate Relations, World Bank. To find out more about the European Peace & Security Studies Certificate (EPSS), check the project page, HERE.